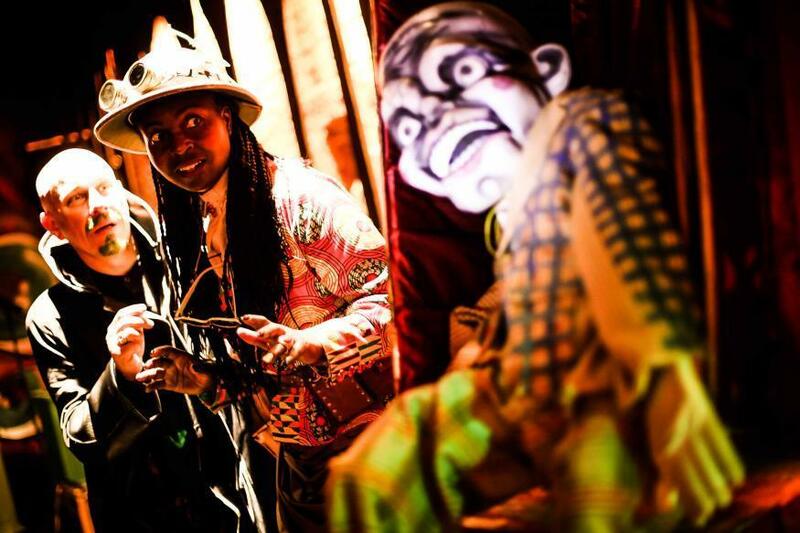 Ever since Goosebumps Alive arrived at The Vaults last month to rave reviews, we’ve been eagerly anticipating the kids version. After all, it made complete sense for the makers of this immersive theatrical adaptation to bring the stories to life for their original intended audience. If we're completely honest, much of R.L. Stine’s bestselling children’s novels passed this writer by until the recent film production, being too old to appreciate them during their 1990s heyday and now with children just a little too young to be enjoying them for themselves. What we did know of his work, however, was that it's celebrated for being as humorous as it is scary, and true to the books this adaptation promises to reflect this ‘wholesome’ horror with an array of unusual characters and curious settings for us to explore. Proceedings are a little slow to get going, which is always a challenge, but with the welcome arrival of the Professor our journey is underway, scaling the dark narrow walkways and disorientating tunnels that occupy the space under Waterloo station. As we set off on our mission our task is clear — do not be scared! A ‘fear-o-meter’ rating of over 100% would immortalise us all to remain as museum exhibits for the rest of our days. It isn’t long before we realise that every room we visit will have varying degrees of mental scarring on our accompanying children. First we’re in the home of poor Carly Beth, unable to extract herself from The Haunted Mask. Next we come face to face with the Body Squeezers, frightening a young girl and her mum half to death. Every twist and turn sends most of the young audience jumping into the arms of their carers, with some never quite recovering or choosing an early exit. “It’s meant to be fun,” we keep repeating reassuringly, but judging by the facial expressions of the kids, they’ve definitely missed the joke. The problem with Goosebumps Kids is that it is just too scary. Haunted houses are fun. Ghost trains are fun. Pantomime villains are fun. Last year’s Adventures in Wonderland was fun. Why? Because they have just the right balance of immersive theatre and interaction to make it all magical and reassure the young audience that it is just for laughs, a sentiment which might have been lost in the impressive characterisation. Yes, there's some hamming around, but in such an atmospheric setting the stories feel real, leaving not only too many children scared, but too many parents scared about how scared they were, making it more an endurance than enjoyment. Where the production does succeed is, that like the outcome of many Stine stories, we learned a lot about the strength of the kids' resolve. Our young companion was determined to face the situation head on, seeing it through to the end, despite the opportunity to escape at any time. In the cold light of day and from the relative safety of the street, she was able to agree it was perhaps “fun but in a scary way”. Some of the older children might have felt the same. Either way, she’d most definitely heeded the Professor’s closing words; “laugh in the face of something scary and it will all go away”. Our only wish is that they’d told us that right from the start. Goosebumps Kids is on at The Vaults, Leake Street, SE1 7NN until 5 June. Children and adult tickets £15. Strictly children 5-11 years old only. Londonist attended on a complimentary press ticket.